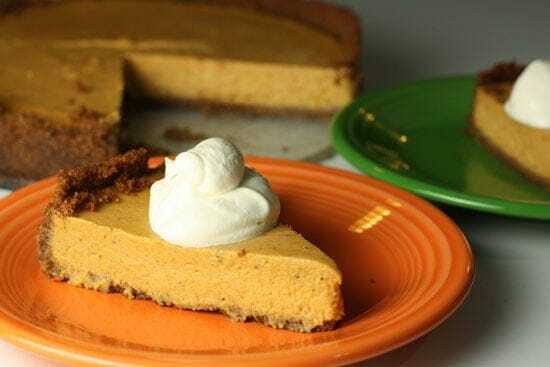 One of my coworkers recently brought me the latest issue of Cooking Light and showed me this awesome recipe for a Vanilla-Bourbon Pumpkin Tart. It looked really good, but I’m honestly not one to practice the “Light” part of cooking. Don’t get me wrong, I can do healthy, but if I’m going to make a pie or a tart or something, I generally want it to be delicious and not half-assed. So I’m very skeptical about light recipes, but it did look really good so I gave it a shot and tried to restrain myself from making too many adjustments to the recipe. There were a few changes that I couldn’t help but make though. First, they call it a tart. To me, it’s a cheesecake. Semantics I guess. Second, I’m sorry but their crust recipe was just not going to work for me. I tried it and I couldn’t get it to stick together. Also, I don’t believe in low fat cream cheese. Sorry, but that’s just the way I feel! 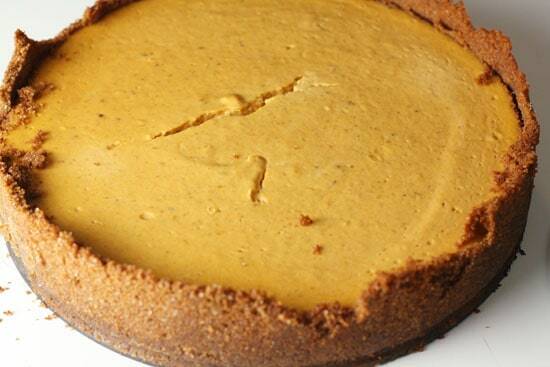 A nice bourbon and vanilla flavored pumpkin cheesecake in a graham cracker crust. 1) Crush up your graham crackers (or you can buy crumbs if you want) and then add your sugar and drizzle in your melted butter. Mix everything together with a fork. It should be loose, but if you press on it, it should clump together. 2) Start loading crust into springform pan. 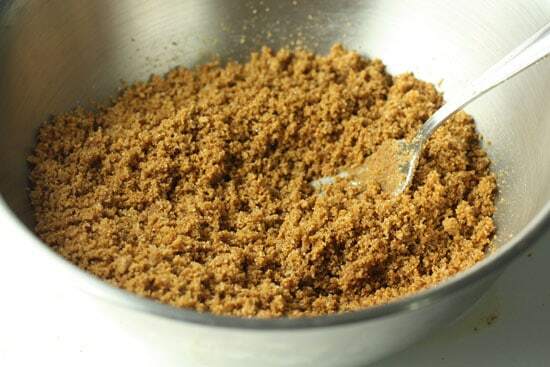 Use a measuring cup to press down the crumbs. Work around the edge with the measuring cup until all the edges are about the same thickness and pressed firmly together. Work slowly and make sure it is all really packed down well. It’s very important to have a good sturdy crust. 3) Bake this crust in a 350 degree oven for 8-10 minutes. Then let it cool completely on a wire rack. It should harden up nicely as it cools. 4) For filling, beat together cream cheese and sugars. Once they are well incorporated and light, add the eggs and pumpkin (be sure to buy 100% pumpkin and not the pumpkin pie filling). Mix that all together and then add all other ingredients. 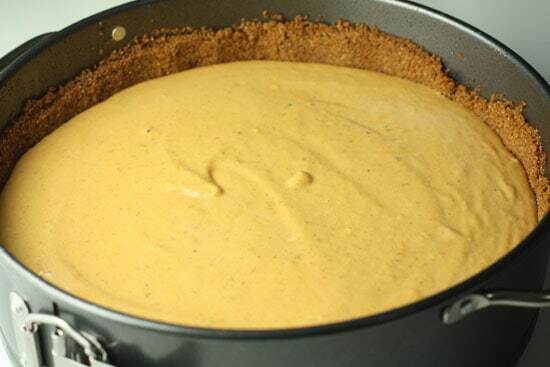 5) Once pie crust has cooled down, you can pour filling into crust! 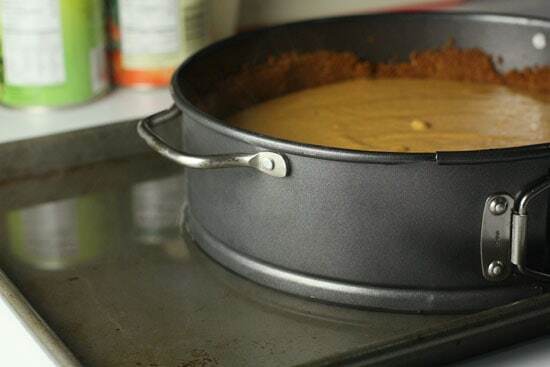 6) Set pie pan on a large baking sheet and then pour 1 Cup of boiling water around the pan right before sticking it in the oven to create a water bath. 7) Bake at 350 degrees for 35-40 minutes or until the center barely wiggles when you tap the side. 8) Cool the pie to room temperature on a wire rack and then refrigerate it for at least 4 hours. 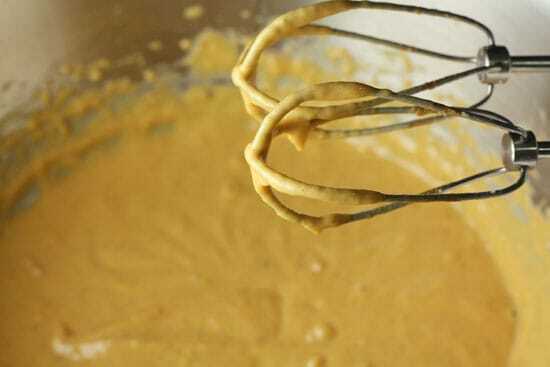 9) Whisk all the whip cream ingredients together and then dollop it on top! I really did try to make the crust from the original recipe and I couldn’t get it to work out. I didn’t want to risk it falling apart so I just used a recipe that I’ve used before. It’s pretty surefire. 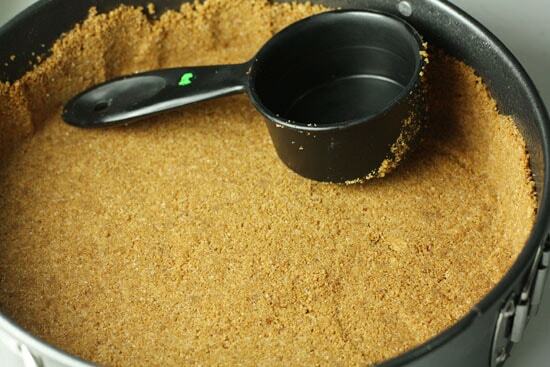 A simple, normal graham cracker crust. 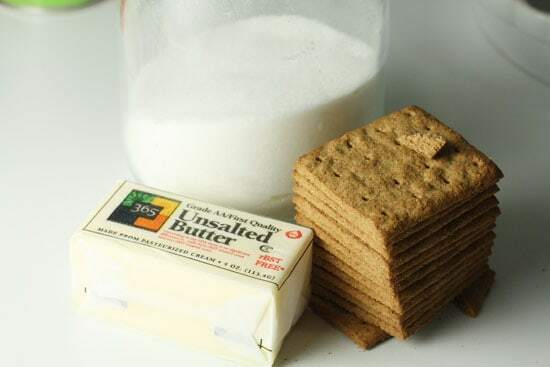 Crush up your graham crackers (or you can buy crumbs if you want) and then add your sugar and drizzle in your melted butter. Mix everything together with a fork. It should be loose, but if you press on it, it should clump together. Start loading it into your springform pan (or you can use a normal pie pan I guess). One trick I learned, I think from Alton Brown, is to use a measuring cup to press down the crumbs. Work around the edge with the measuring cup until all the edges are about the same thickness and pressed firmly together. Work slowly and make sure it is all really packed down well. It’s very important to have a good sturdy crust. Bake this crust in a 350 degree oven for 8-10 minutes. Then let it cool completely on a wire rack. It should harden up nicely as it cools. I used nice bourbon for the recipe not because I think it’s necessarily important for the pie, but because I intend to drink the leftovers and so I bought the good stuff. You’ll need a variety of other ingredients as well. The only other change, besides the crust, that I made to this recipe was to sub in real cream cheese. I don’t trust low fat cream cheese! Give me the real stuff please. Start by beating together your cream cheese and sugars. Once they are well incorporated and light, add the eggs and pumpkin (be sure to buy 100% pumpkin and not the pumpkin pie filling). 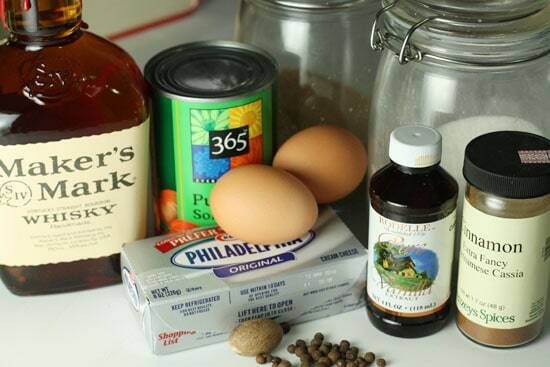 Mix that all together and then add all your other ingredients. It’s a pretty quick filling to pull together actually. I used whole spices and ground them up myself, but feel free to just use ground stuff if that’s what you have available. Once your pie crust has cooled down, you can pour your filling into your crust! Don’t worry. The filling is pretty runny at this point. You need to bake this in a water bath to ensure that your filling sets and stays moist. I did this by setting my pie pan on a large baking sheet and then pouring 1 Cup of boiling water around the pan right before sticking it in the oven. The water will form steam and help the pie set up nicely. Bake this creation at 350 degrees for 35-40 minutes or until the center barely wiggles when you tap the side. Again cool the pie to room temperature on a wire rack and then refrigerate it for at least 4 hours. Ok. There aren’t really any instructions on how to eat it. You know how to do that. What’s nice about the springform pan is that you can take out the entire cheesecake which makes it really easy to cut and serve. Some tiny pieces of my crust fell off in the process, but in general it held together fine. Spring form pans are pretty sweet. If you are making your own whipped cream, just whisk all the above ingredients together and then dollop it on top! Honestly, the cheesecake is pretty good without the whipped cream also so if you’re looking to really save some calories that might be the place to do it. Ok… so I stayed pretty true to the recipe. I think my changes definitely improve the final product (especially the crust). Granted I didn’t taste them side by side, but I just have a feeling that my version is worth the few extra calories. I can say this because, well, my version turned out delicious. 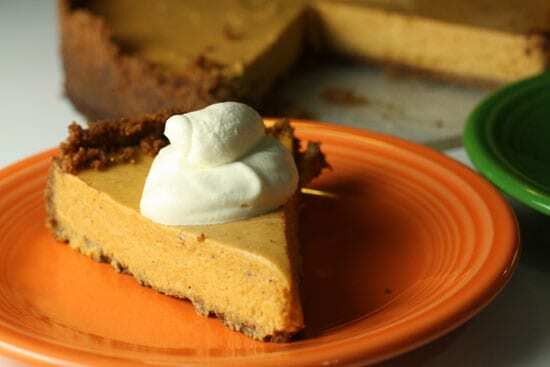 I think this would be a pretty great alternative to the classic pumpkin pie for tomorrow’s Thanksgiving feast. This sounds really good, going on the must make list!! Want to wish the both of you a wonder full Thanksgiving! My daughter has made the recipe from the American Test Kitchen website but I haven't tasted it yet. It said to squeeze all the moisture out of the pumpkin so I think it will be a very dry cheesecake. Your version is more to my taste, have you tried to sub sweet potato for the pumpkin? Use the same spices and try it. I love both types. you should warn people to wear bibs before they read this post. « Chestnut Stuffing Recipes Home » Happy Turkey Day!